This article appeared in the The Wood County Amateur Radio Club newsletter CQ Chatter August 2016 edition. My favorite digital mode has to be the “JTs” otherwise known as JT65 and JT9. Many have equated them to watching paint dry. Others call it the musical mode. I call it my ADD mode. 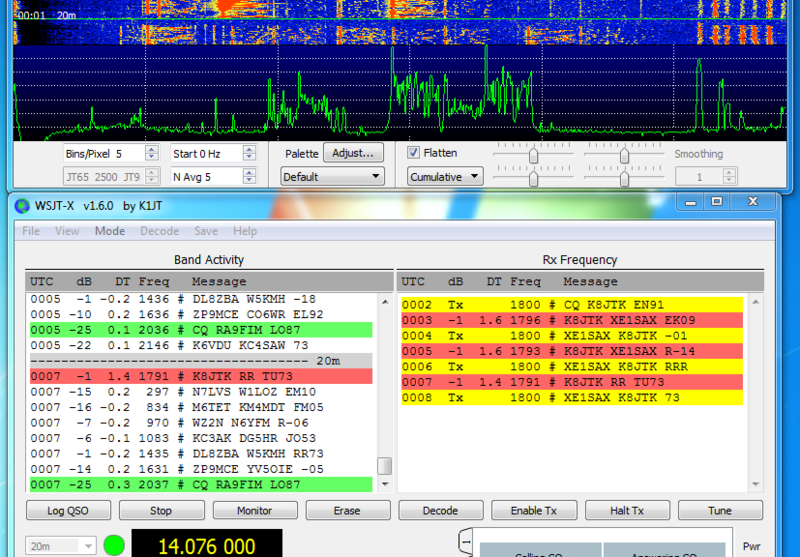 Whatever you call ’em, JT65 has become one of the most popular digital modes second only to PSK. I call it my ADD mode because I can browse the web, watch TV, or write this article during the 7-minute exchange. But you better pay attention because it can still keep you on your toes! JT65 and JT9 began with Nobel Prize Winner Dr. Joe Taylor – K1JT. One of Dr. Taylor’s passions was weak signal communications and moonbounce (EME). A signal is sent toward the moon at about 1.5 kW on VHF using large directional antenna arrays. The signal is reflected off the moon and received by an equally powerful station with large arrays. After the signal makes the 500,000 mile round trip, there wasn’t much left. CW was the only effective mode. In 2001, K1JT came up with JT65 which allowed hams to make Earth-Moon-Earth contacts with 150 W and 11-element beam antennas. Still not exactly easy but it made EME a possibility for many more hams. 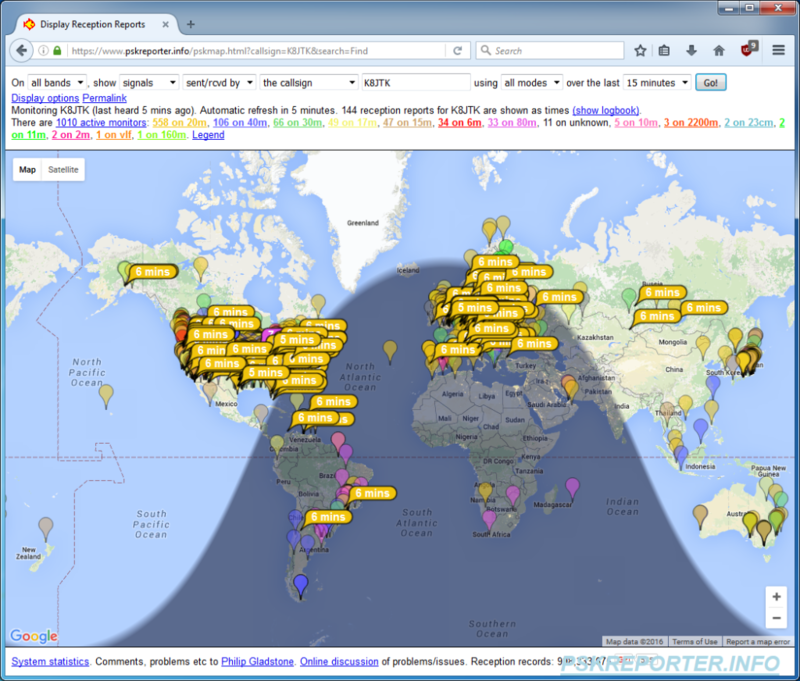 Years later it was discovered that JT65 works great on the HF bands too. It allows stations to make contacts without high power or gain antennas. This is perfect for hams that cannot have large or visible antennas. 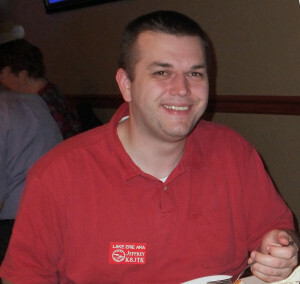 Over time, JT9 was added specifically for the LF, MF, and HF bands (“Work the World with JT65 and JT9”). It’s not my intention to dive into the technicals of any mode but to give hams practical operating information. When talking about JT65 almost all information applies to JT9 as well. Both are highly time-synchronized. The computer’s clock must be as accurate as possible and within 2 seconds of other stations. One minute transmit and receive sequences are utilized. Transmitting happens within a one-minute window then the roles are reversed for the following minute. Stations begin transmitting 1 second after the beginning of the minute and stop 47.7 seconds later. In the remaining 11.3 seconds applications decode received signals, display them on screen, and receiving stations get their message ready to transmit. The total exchange takes about 7 minutes. More if the message is lost or not decoded. Being such a robust protocol doesn’t leave room for long messages meaning it’s not a conversational mode. The maximum message length is 13 characters with the intent of limiting the exchange to call signs and signal reports. Below is an actual exchange. The first column is the time, second is the exchange, third is the exchange translation. Exchange beings at 01:00 UTC and completes at 01:07. In messages with two call signs, the receiving station is to the left and the transmitting station to the right. I’m calling CQ from grid square EN91. K5ND is returning my CQ from grid square EM12. I reply to K5ND with his signal report of -1 db (RST Sent). K5ND responds with my signal report of -5 db (RST “R”eceived). K5ND responds with best wishes. I respond with best wishes. 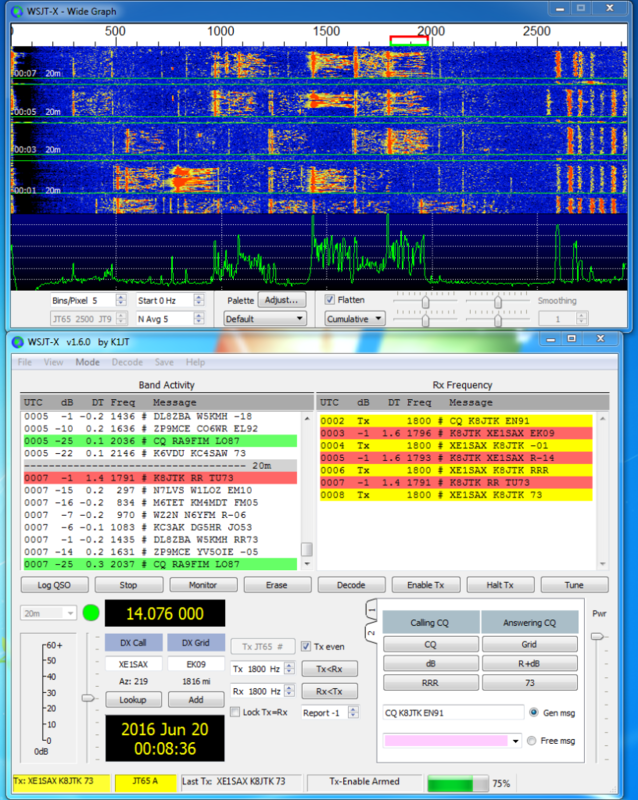 Differences between JT65 & JT9 are bandwidth and signal reports. JT65 takes up just under 180 Hz and about 16 Hz for JT9. 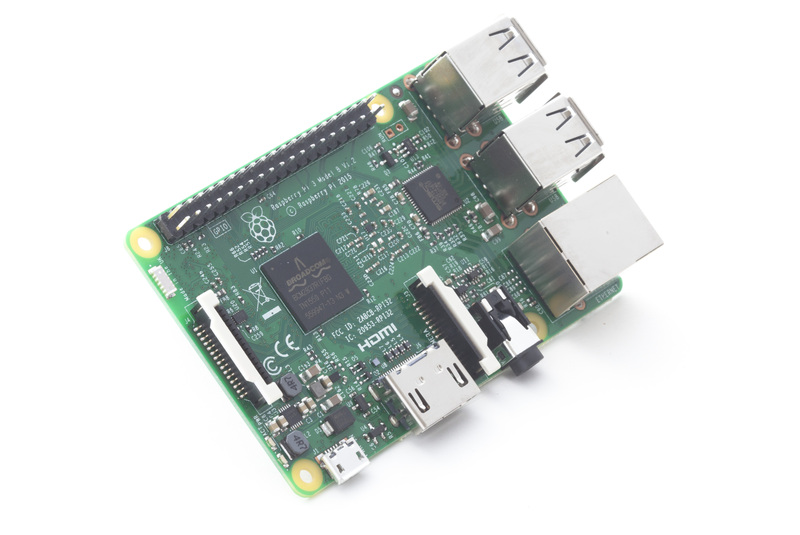 JT9 is much better for spectrum efficiency and uses less power due to narrower bandwidth. The JT65 sub-band can often be seen with multiple overlapping signals and they usually decode correctly. JT9 can have ten-times the signals but decoding of overlapping signals is much less likely to happen. Signal reports range from -1 to -30 db signal-to-noise in JT65. The lowest I’ve seen is -27. They are capped at a -1 db upper limit to keep somewhat consistent with EME reports. 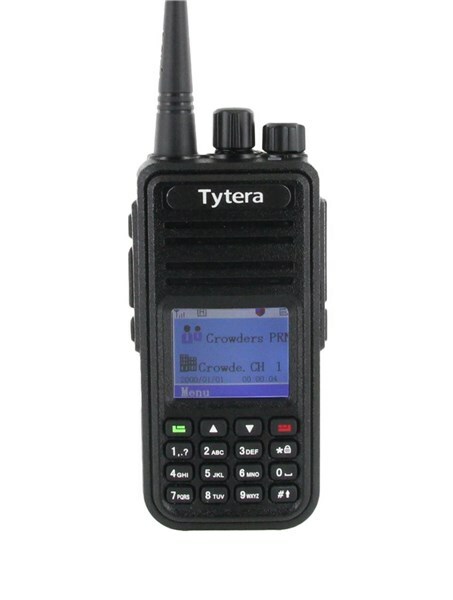 JT9 is extended to give more accurate signal reports with a range from -50 to +49 db. The limits I’ve seen are -27 and +15. Propagation is comparable between the two modes. JT65 is the overwhelming favorite of operators. JT65 & JT9 have their own sub-bands. Below is a listing of those frequencies. JT9 is typically 2 kHz above the JT65 frequency. USB is the mode regardless of band. Software is available on all major platforms. Ham Radio Deluxe is expected to include JT65 in the very near future. JT65-HF (http://jt65-hf.sourceforge.net/). It’s very reliable and I’ve only noticed one issue where free hand text doesn’t always transmit. This is the old standard but no longer in development. JT65-HF-HB9HQX-Edition (http://jt65hfhb9hqxedi.sourceforge.net/). This is the replacement for the above. It’s built on the same code-base so look and feel are similar. The developer has implemented many new useful features. I recommend using this one for newcomers. WSJT-X (http://physics.princeton.edu/pulsar/k1jt/wsjtx.html). Software released by K1JT. This seems to give the most accurate signal reports. It’s the only program that currently implements JT9. 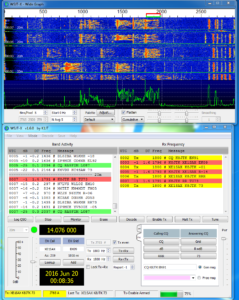 WSJT-X is the program that I use. Application setup is fairly straight forward. In the setup, enter your call sign and grid square. If you don’t know your grid square, check QRZ or enter your address on: http://www.levinecentral.com/ham/grid_square.php. Choose the correct sound input/output devices. Configure Rig Control/PTT if needed. Rig Control is not required but helpful when using the internal logging methods. Before starting any of the applications, ALWAYS sync your computer’s clock with the Internet. In Windows, go to the Control Panel, Date and Time, Internet Time tab, Change settings, click Update now. Most Linux distributions need to invoke ‘ntpdate.’ One feature of the HB9HQX version is automatic time syncing every 15 minutes. All programs have the same general layout and operate in the same manner. They have a waterfall showing signals received and display markers indicating active transmit and receive windows. These can be moved by clicking on the waterfall. Conversational buttons and boxes are often labeled Calling CQ and Answering CQ. These buttons automatically generate text during the conversation (following the standard exchange format). Free Text/Message is for free hand text. Other buttons will enable and disable transmitting. Halt will interrupt the transmission midway through. Even/odd indicates which minute you will transmit (only applies to calling CQ). It has no effect when answering a CQ because the software will transmit in the next minute. The Signal Decoding window is the most important because this is where all conversation exchanges are displayed. A couple labels are seen: UTC – time the signal was decoded, Sync – measurement of the sync signal — higher the better, DT – time difference between decoded station and yours — should be less than 2 seconds, DF – frequency deviation above or below the center point in Hz, and finally the Exchange or Message text. Colors are frequently used to distinguish items of importance. Green is a station calling CQ, red is a message/exchange intended for your station (contains your call sign), gray is exchanges between other stations. Luckily the software takes care of much of the exchange. It generates response messages by double-clicking a received line. Stations that don’t follow the standard format can easily confuse the software. This is where it will keep you on your toes. If you’re not careful you can end up sending a message twice or not properly advancing to the next message in the exchange. The software does not automatically advance the conversation for you. If things go off the rails, use the appropriate conversational button to get things back on track. The Free Text field can be used for noting your power, antenna, or sending holiday greetings. These messages are often in place of the 73’s and will not show up in red because no call signs are included. You may see “30W DPL” (I’m running 30 watts into a di-pole antenna), “50W LOOP” (I’m running 50 watts into a loop antenna), “THX 4 NM” (we’ve worked before, thanks for the contact using a new mode from previous contacts), “THX 4NB” (we’ve worked before, thanks for the contact on a new band), “SRY/SRI NO DECODE” (I see a signal on the waterfall but it did not decode) you’ll see this one but it’s not commonly used, “MERRY XMAS” –you get the idea. It’s only 13 characters. Be careful not to baffle the user and you have to be quick. There are some I’ve received that I still have no idea what they mean. In the JT’s it’s ether a clean decode or nothing at all. No in between. When I see a signal on the waterfall and the message doesn’t decode, I always send my last message again. Some stations will not transmit in the following minute. Other stations (wrongly) move on in the conversation. Then I have to use free hand text to send “SIG RPT?” or similar because I didn’t receive my signal report. At minimum, I make sure RSTs (reliability – strength – tone) have been exchanged and won’t log the contact until “RRR” has been sent/received. Some QSLs I received go as far to log the DF frequency. I’ve only logged the center frequency. After you feel comfortable monitoring activity, double-click a green “CQ.” The Generated Text field will update with your call sign, their call sign, and your grid square. You’re off! Also, refer back to article two for station/DSP/audio setup. I’ve seen some of the worst over modulated signals on JT65. JT users are really good about uploading spots to PSK Reporter (https://www.pskreporter.info/pskmap.html). You can use it as a ‘reverse beacon’ network to see where your signal is propagating.